A hand crank weather radio may be an old device but it is still as useful as it used to be. This tool is highly recommended to be included in your emergency kit because of its awesome perks it provides. Most advanced tools are missing these advantages today. We believe this outdated radio is still packed with features that you’ll need in case of an emergency. Using a hand crank weather radio during calamities can greatly help the situation. It is compact and lightweight which allows you to store it easily anywhere. Whether you put it in your bag or in your pocket, you’ll have no problem with bringing this radio with you anywhere. This tool is also free from batteries or electrical outages because it is manually powered. Another way to recharge this radio is through solar power. Other Benefits of having a hand crank weather radio are the following. You’ll have access to weather alerts by NOAA weather radio. If you’re stranded in a building with no electricity because of a thunderstorm or flood, it is important to know what is going on outside. These national weather radio stations will give you the latest updates about the current situation and whether it is now safe or not to go outside. Because of the radio’s electricity and battery independence, you’ll easily get these updates without worrying if you’ll run out of power soon. A hand crank radio has built-in flashlights. Tendency is, without the electricity, everything’s dark at night. It can get extremely difficult for you to move around the house or the building to check on your other family members especially the children. With the help of the radio’s flashlight feature, you’ll have a source of light that never goes out of energy. Having this lighting source can help you with eating in the dark as well. In case of calamities, you’ll have to keep everyone safe and help calm them down. A hand crank radio also has USB chargers for phones. With the electricity down, you won’t have any energy source for your phone to charge. Many people will not realize this until it is too late to do anything about it. Be Prepared!Keep in touch with your loved ones by charging your phone through this radio.As your parents might be worrying about you from another place, give them the assurance that you are safe by never running out of battery power for your phone.It is also greatly beneficial for using your cell phones if you need to call authorities for an emergency during natural disasters. 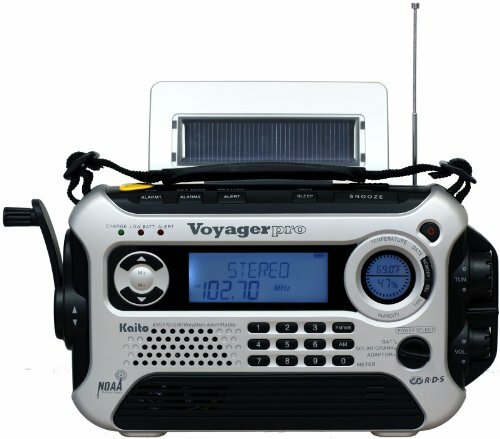 Solar panels are also one of the most common features of hand crank radios. This allows the user to have another charging option for his or her radio. If you want to continuously use your radio at night, you can recharge it at daytime, so you won’t have to manually charge it anymore when using it. Water resistant hand crank radios are also now available in the market. This makes it a really great tool for calamities or camping trips. Having a tool that can withstand the weather is a great advantage because most electrical devices now would not survive water or rough treatment. Calamities can happen all the time. With the changing whether, we wouldn’t know when natural disasters will occur. That is why it is better to be prepared and ready your emergency kit to go through catastrophic events like thunderstorms, floods, and snow storms that can keep you stranded in your house or your office’s building. A hand crank radios is old-fashioned but it is one of the most important tools that to have in dangerous events. It is convenient and gives you features that can be very useful. This radio may be outdated but it is still as powerful and helpful as the latest devices that you’ll find today. http://blog.EtonCorp.com - Video featuring the capabiities of the American Red Cross by Etón SOLARLINK FR600 with Self-Powered Digital AM/FM/SW/NOAA, S.A.M.E. Weather Radio with Flashlight, Siren, Solar Power and Cell Phone Charger. Etón has established themselves as being one of the top specialty radio companies in the world. With more than 20 years experience, Etón radios are ideal for any adventure, travel, or emergency situation. Etón got its start as a licensee for Grundig shortwave radios and it continues to be a name you can trust in times of need. We currently have product lines with the American Red Cross, Porsche Design, and also a Buzz Aldrin endorsed Grundig radio. Our radios protect you by providing you with all the information you need to stay safe in any crisis. At Etón, we have built our reputation around innovative products with our unique mix of design and technology, but we also like to give back. We work with such charitable organizations as Ears To Our World to provide self-powered radios to schools in developing countries. So when the next emergency or natural disaster strikes, make sure you are prepared. Prepare yourself with an Etón radio.